Marketing challenges > How To Never Forget An Attachment Again! How To Never Forget An Attachment Again! If you use Gmail, you may have heard of the Forgotten Attachment Detector. We love this tool because it prevents the inevitable embarrassment of the “Did you mean to attach something?” response from a client or a fastidious colleague. Today, we came across a Microsoft Office Labs project, nicknamed FAD. It’s the Outlook equivalent of the aforementioned Gmail feature. The tool has been around for a while, and we were unaware of its existence until now. It’s so useful, we though it rude not to share with as many of our faithful followers as possible. Cue the power of the social network! The tool is installed as an add-on to Outlook 2007 or 2010 and can be downloaded directly from Office Labs. 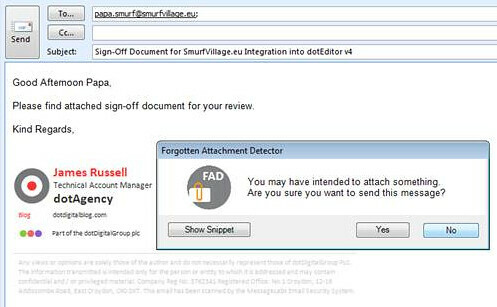 Once installed (you’ll need to restart Outlook to complete) the tool will check your e-mail message for keywords such as “attached” or “included” and will notify you if you attempt to send with no attachment. You’ll never need to admit to a client or customer that you’d forget your head if it wasn’t screwed on!